Health insurance shoppers must be able to distinguish the plan benefits that affect costs, understand tradeoffs, and weigh choices in an informed manner. Currently, consumer information about health insurance is quite limited. A very important aspect of selecting a health plan is the percentage of total health care expenses that the plan is likely to pay. Actuarial value provides an estimate of this plan payment percentage. The consumer will find actuarial value most valuable along with other information about the plan. Actuarial value presents a more meaningful measure than any single cost-sharing provision in that it will provide a single number that represents a good summary measure of likely payments by a plan. Actuarial value is a measure of the relative percentages paid by a health benefits plan and its members. It is calculated using the medical claims from a standard population, along with a plan’s cost-sharing provisions, to simulate the payment of claims. The percentage of charges paid by the plan is the actuarial value. Actuarial value is expressed as a share of all medical expenses. For example, an actual value of 0.75 would mean that the health benefits plan would pay 75 percent of covered medical expenses for a standard population. The US Department of Health and Human Services (HHS) intends to develop a publicly available actuarial value calculator that health plans would use to determine their actuarial value. This calculator would be developed using a set of claims data weighted to reflect the expected standard population in the applicable markets for the year of enrollment. The calculator method will ensure a consistent set of assumptions and methods in actuarial value calculation. In 2008, The California Healthcare Foundation commissioned a study by Watson Wyatt Worldwide - a human relations firm - to show how actuarial values can be used to evaluate health insurance plans. The results demonstrated considerable variation in actuarial values among individual health insurance plans (Los Angeles County 2006) plans, ranging from 32% on the low end to 85% on the high end. This wide range reflects major differences in deductibles, out-of-pocket maximums, and other cost-sharing provisions. Secondly, no single plan benefit is fully predictive of actuarial value. Premiums and actuarial value tend to be correlated. Products with more comprehensive benefits, less cost-sharing at the time of service, and higher actuarial value tend to have higher premiums. However, premium level and actuarial value are not highly correlated. 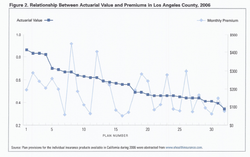 The image to the right (click image to magnify), shows how actuarial values related to the premiums charged by health plans in Los Angeles County during 2006 for a 32-year-old individual. The left scale shows actuarial value, the right scale shows monthly premiums, which ranged from a low of $56 to a high of $448. The chart shows that two plans might have very similar actuarial values but very different premiums. Actuarial values - had they been available - would have shown consumers how to find some genuine bargains and how to avoid some real stinkers. The Affordable Care Act (ACA) uses actuarial values to define qualified health plans into 4 plan tiers by actuarial value. Starting in 2014, actuarial values will aid consumers in choosing a health benefit plan both within the exchanges and in the private market. Platinum — Covers 90 percent of actuarial value with consumer cost-sharing of 10 percent. Gold — Covers 80 percent of actuarial value with consumer cost-sharing of 20 percent. Silver - Covers 70 percent of actuarial value with consumer cost-sharing of 30 percent. Bronze - Covers 60 percent of actuarial value with consumer cost-sharing of 40 percent. Return to the Health Care Reform Index Page.